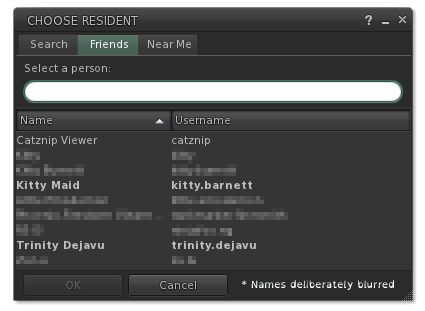 Following a request on our JIRA to add names to the friends tab of the avatar picker (used for group & friend invites and sharing inventory) [CATZ-116], the following will be part of Beta R9.0.11 and in addition to the second column makes the list searchable and shows on-line friends listed in bold. Much better for people with a LOT of friends. The built in updater also got some more work, shows progress of the download and resumes should the client be restarted part way though. There is also menu item to manually check for an update. We don't want to do another update to the beta without this in place to avoid future confusion. Really looking forward to this being live. I want to talk to Linux users and get some feedback ion how they run the viewer and what they would expect an updater to do in practice. A huge thank you to everyone who has gotten in touch and especially those who have helped out on the JIRA and submitted translations.